We love cars that seem to follow the philosophy of the old days when design and driving feel were paramount. We also love all the modern tech that enables huge power gains from smaller turbocharged engines. Those two things put together give us the modern Alfa Romeo Giulia. 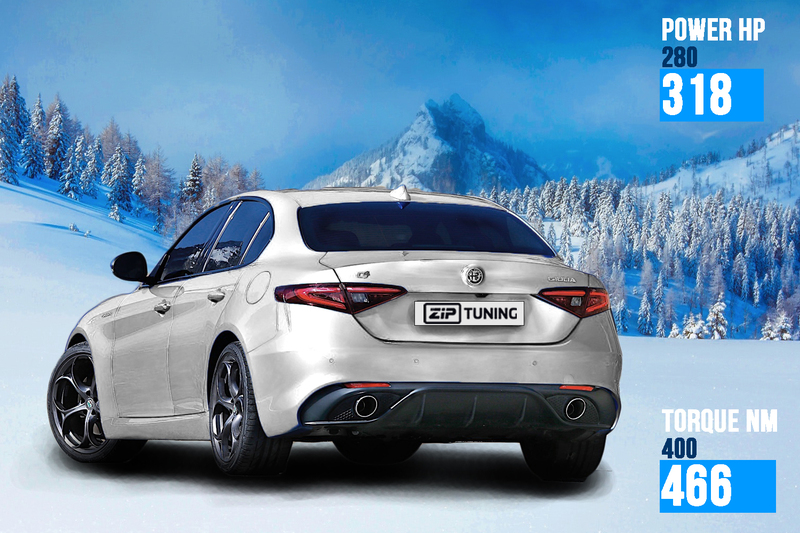 Add to the mix the knowledge and experience of ZIP Tuning engineers and you get the stunning results from our Alfa Romeo Giulia Veloce tuning. The Giulia is a luxurious, stunning executive car, but it is also a relatively lightweight machine with amazing agility, great steering response and wonderful engines. Even though it is aimed at being lavish, it is also a real driving machine. The Veloce addition to the name means that this Giulia is packed with sporty features, including the turbocharged GME MultiAir 2.0 petrol engine which, as stock, produces 280 hp and 400 Nm of torque. Having forced induction means two things. First of all, it means that the torque is available from a lot lower RPM which makes it very nice to drive even in everyday conditions. Secondly, it means that the Giulia Veloce tuning results in substantial gains. It is worth noting that the Giulia we worked on was bought in Germany. This means that it has Q4, Alfa Romeo’s all-wheel-drive system. UK version of the Veloce has RWD. The power increase for the Stage 1 tuning that we performed on this particular vehicle comes only from OEM ECU software adjustments. There are no new parts, which can have good and bad sides. 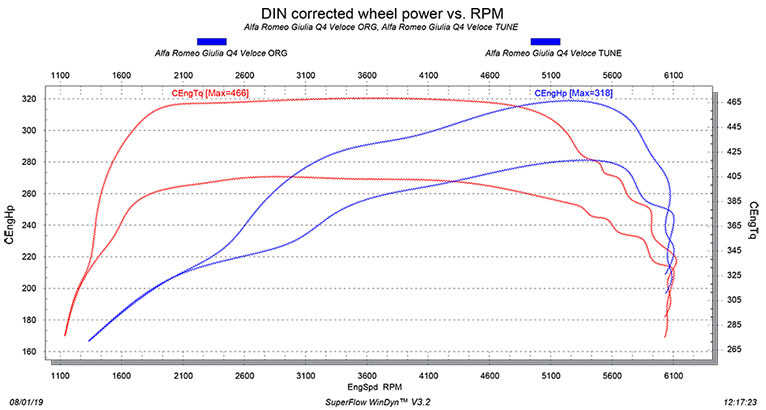 The good side of the fact that there are no new parts is that the power gains are very cost efficient. On the other hand, OEM parts are somewhat limiting, so the power increase can only be brought to the levels that the stock parts can endure. This is why extensive knowledge and expertise of the engineers performing tuning are very important. Having all the right information, performing extensive dyno testing and data logging and making use of our expertise and experience means that our engineers can safely approach the limits of the OEM parts, but never exceed them. This results in great power gains from our Alfa Romeo Giulia Veloce tuning which are completely safe and leave the car as reliable as before. If you want even more power, we also offer that. 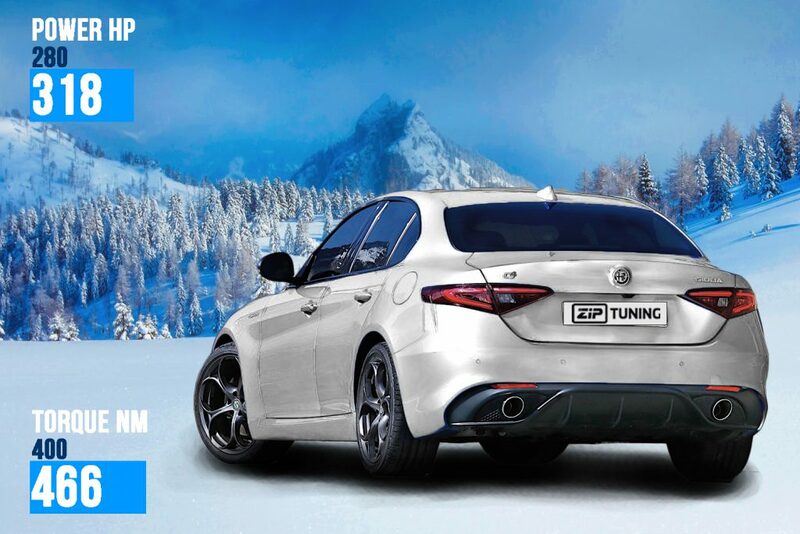 We can create dedicated Stage 2 or Stage 3 tuning projects for the Giulia Veloce which include some aftermarket parts that give more room for safe power increases. The owner of this particular car was more than satisfied with the power gains from the Stage 1 tuning alone. He got 318 hp and 466 Nm of torque to play with. Importantly, he insisted that the drivability of the car is kept the same or further improved. This matches our tuning philosophy completely, so we gladly obliged and made the torque and power available in a very wide RPM range. The power increases of our Giulia Veloce tuning come from a host of changes including turbo pressure levels, fuel delivery and ignition timing. The change in turbo pressure sends more air into the cylinders which is a good base for the power increase we produced. However, for petrol engines in particular, the ratio of air and fuel needs to be as close to perfect as possible. This means that the improvement in turbo pressure requires a change in the amount of fuel sent into the engine. When you put these two adjustments together, they result in more air and fuel in the cylinders which produces more power. However, that is not the only thing we tuned. We also changed ignition timing. This adjustment does not do much for power gains, but it makes the world of difference for improved combustion and throttle response. Advancing ignition timing leads to much faster throttle response. The already amazing engine reacts much faster to any throttle input, so it gives a much more immediate driving feel. It is very important to note that advancing the timing too far can result in serious damage. This is why our testing and data logging is of the highest importance. We can provide an outstanding improvement in throttle response, making it next to instant, while still keeping the car completely safe. If you are a tuner and you would like to offer this service to your customers, you can register on our tuners portal and start enjoying the benefits of having the best engineers in the industry work for you.